Tina loves to play the music for Irish dancers to dance to. Being an Irish dancer herself, she knows how important the music is to every dancer’s performance. 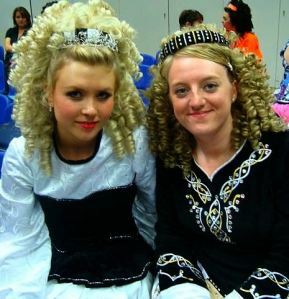 It is an integral part of Irish dancing. Tina’s aim is to create and play music which is fun, lively, and bouncy. As well as playing traditional tunes and contemporary tunes, Tina also composes many of her own tunes. This all adds variety and excitement to the music for the dancers, the audience and Tina herself. In 2012 Tina released her debut Irish dance album Féistastic. This exciting CD boasts 20 tracks including traditional and contemporary Irish and Scottish tunes as well as many original compositions by Tina. Shortly after releasing the CD, Tina brought out a tune book, Féistastic Tunes, which accompanies the CD. She released an exciting follow up CD in 2013, Féistastic 2, which has been popular worldwide. In 2017 she released the third in the popular series of albums, Féistastic 3. When playing at féiseanna Tina plays a Yamaha PSR 2000 keyboard. She play all the melodies live with her right hand and the accompaniment with the left. Click here to book Tina for a féis.